Around early December in eastern Bangladesh, hundreds of people boarded a few rickety wooden boats and embarked on a journey they thought would convey them to a better life. They would perhaps land on Thailand's southwestern coast and then seek work there or in the Muslim promised land of Malaysia. On Dec. 28, 98 of them were found drifting by India's remote Andaman Islands, starving and dehydrated, a picture of the hardship weathered by generations of boat people fleeing adversity only to fall into even greater trials. Reports trickling out in recent weeks from various countries lining the Andaman Sea have related portions of this ordeal as well as other, similar incidents involving the same ethnic group. But the tale of one survivor has emerged that, if accurate, paints a picture of a dehumanizing odyssey, portraying the actions of surrounding governments in horrific tones. 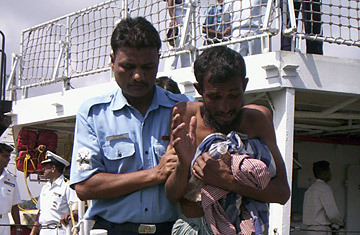 The man's name is Muzaffar, and his testimony was obtained over cell phone from his place of temporary detention in India by the Arakan Project, a Bangkok-based group advocating the rights of these boat people. Muzaffar's account appears to amplify other published reports  except in greater detail. He said Thai security forces first forcibly detained him and hundreds of other refugees offshore and then towed them back into international waters in a motorless barge, where they were at the mercy of the shark-infested sea. More than 300 people who were with Muzaffar are missing; they are all believed to be dead. These refugees were subjected to such treatment partly because few will defend them. Muzaffar, whose full name is being withheld by the Arakan Project, is a member of the Rohingya community, a Muslim ethnic group living in abysmal conditions on the margins of Burma and Bangladesh. Some 800,000 Rohingya, who look South Asian, remain in western Burma, where they are denied citizenship and most rights by the military-run government; about 200,000 eke out an existence in squalid refugee camps across the border in Bangladesh. A scattered, quiet diaspora scratches at the fringe of society in countries as far-flung as Saudi Arabia and Indonesia. Stateless and unwanted, they are one of the world's most forgotten people. Over many desperate years, they have tried to flee to the comparatively richer climes of Southeast Asia. Waves of Rohingya migrants routinely take to the sea from the marshlands and jungle of eastern Bangladesh, often with the help of people smugglers who charge extortionate rates for their services. One report says Thai authorities alone picked up 4,886 Rohingya in an unspecified period from 2007 to 2008. Muzaffar was part of the most recent exodus. According to the transcript of his interview with the Arakan Project, Muzaffar claimed that after he and his companions had sailed for 12 days in a contingent of two boats, the Thai navy picked them up and moved them to a barren isle off the Thai mainland  NGO sources suspect this is Koh Sai Daeng, or Red Sand Island  alongside Rohingya detainees captured from other refugee expeditions. They were 412 in total. For eight days, Muzaffar said, they were kept in the open and given little more than "two mouthfuls of rice" per meal. Thai soldiers, he said, "beat us up whenever they felt like it." Then, Muzaffar said, they were all taken aboard a navy vessel, which towed an empty, open-deck barge behind it. The ship, he said in the transcript, sailed for a day and a half into international waters, at which point it stopped and the navy men allegedly ordered the refugees to board the barge. "First, they pointed their guns at us but we still refused to move," Muzaffar said. "Our hands were already tied on the Navy ship, but this time they also tied the legs of some people and threw four of them into the sea." Those people, he said, drowned. The rest of the refugees, mostly Rohingya, boarded the barge. It had no motor or sail. According to Zaw Win, another Rohingya detainee interviewed by the Arakan Project, the Thais gave the refugees four bags of rice and two drums of water, a woefully insufficient supply for over 400 people with nowhere to go. Then they allegedly cut the rope between the barge and the navy ship and left. The boat drifted for 10 days and 10 nights. During the daytime, Muzaffar said, he saw "large fish swimming along the boat that looked like sharks." His account went on to say that at night they would see a light, perhaps from a passing ship or a nearby island, and many on board attempted to swim for it lest their boat drift in the wrong direction. "We saw many drowning, one by one, as the current was carrying them away and none of them had any energy left to swim," Muzaffar told his Arakan Project interviewer. Eventually, the Indian coast guard picked up the surviving refugees and immediately noticed their abject state. The coast guard's report stated that there was a significant amount of water flooding the barge; Indian ships reportedly attempted to search for the 300 missing but were able to rescue only nine refugees from the sea. The survivors have been fed and given medical treatment. They are being housed in relief camps, where they were reached by phone calls from the Arakan Project as well as a reporter from the BBC. The Thai government has yet to return TIME's calls on the matter of the treatment of these refugees, but the country's Foreign Ministry released a statement on Jan. 16 saying that officials were investigating the "facts and surrounding circumstances" of the incident. Other reports from around the region suggest that Muzaffar's experience was not an isolated incident. A Jan. 14 story in the Jakarta Post said 193 Rohingya were rescued by Acehnese fishermen on Jan. 7 and are now being housed at an Indonesian naval base. The refugees there claim Thai marines also cut them adrift after destroying the engines on their boats, and they managed to stay afloat by erecting sails made of plastic tarpaulin. Survivors from a second wave of refugees "pushed back" from Thailand  a contingent of some 580  have also made their way to India's Andaman Islands. It is not known whether those who landed at Aceh were part of this same group. The front page of the Hong Kong daily South China Morning Post on Jan. 15 displayed pictures snapped by an Australian tourist in Thailand of Thai troops whipping recently detained Rohingya on the beach of an Andaman island popular for snorkeling  in full view of sunbathing tourists. What happened to this particular set of migrants remains unclear. As a consequence of their downtrodden condition, the Rohingya don't have the kind of diaspora-based support groups that provide publicity and aid to some of Burma's other oppressed minorities. Their plight, though, may be a central issue at the next regional ASEAN Summit, which will take place at the end of February in Thailand. By then, observers hope the Thai government will employ different methods in tackling the problem. "Governments in the region need to put together a proactive plan to meet the needs of the Rohingya," says Garcia. "You can't literally make these people go away, as if they were less than human." But for thousands of Rohingya refugees, that is a fate to which they are all too accustomed.